I am a fan of Eggnog. I love the taste, the texture, the aroma. I love everything about Eggnog. My favorite brand is actually the generic HEB brand. Light Eggnog is too thin, brand name Eggnog is too thick, and Soy Nog - just no. What is my problem with Eggnog then? I am lactose intolerant. Anyone who suffers from lactose intolerance, or milk related allergies, can understand the pain and suffering for you and those around you after ingesting milk. If I had enemies, I would never wish lactose intolerance upon them. It is uncomfortable, unpleasant, and highly inconvenient. The train scene from Samantha’s favorite movie “French Kiss,” sums up lactose intolerance quite well. After Meg Ryan’s character eats more cheese than she can handle, the evil beast rears its head: "Spasm! Spasm! Oh, God, here it comes... lactose intolerance!" (It really is a cute movie if you are looking for a date night rom-com). When the holiday season rolls around I know Eggnog follows closely behind; despite all of the discomfort, I am eager for it. Maybe I am a bit masochistic, but I yearn for Eggnog. I cherish its delicate touch on my tastebuds. I somehow convince myself I have been cured from my lactose intolerance. With every sip (and I do sip to make it last as long as I can) I pray my insides won’t succumb to their evil tendencies. Growing up, I had no problems with milk products. I remember sitting and drinking whole glasses of milk. In fact, if I had trouble sleeping at night, I had a sure-fire concoction to put me back to sleep - warm up a glass of milk in the microwave, dump a whole bunch of sugar into it, and stir in a little maple syrup. As an adult, I can look back and realize I really just put myself into a severe carb coma, but at the time, I thought it was the milk. Then, at some point during my sophomore year in high school, my body rebelled; milk and I no longer agreed. Over the next couple of years, I convinced myself and my parents that Eggnog didn’t bother me like milk did. During the holidays, we bought extra Eggnog and froze it, ensuring that the Nog would be around for the remainder of the year. I didn’t use it in my cereal or anything, it was just there in the event I craved thick, milky sweetness - which of course, I did. Eventually, the realization set in that Eggnog and milk were essentially the same thing, minus some heavy cream, eggs, and a pound of sugar or so, and I let go of my unhealthy yearlong binge. But, despite my acknowledgement of the discomfort it brings, I still look forward to the Eggnog time of year. I am not sure I will ever understand the part of me that willfully ignores the impending results of imbibing Eggnog. 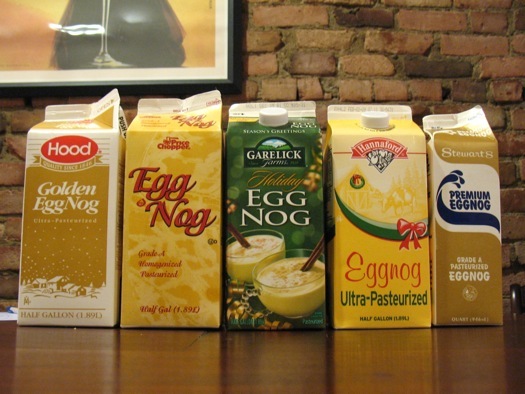 It is not an addiction, otherwise I would seek Eggnog out the rest of the year, which I do not. It is more like a yearly visit from an old friend with whom I share a tumultuous, yet rich history. Yet every year, without fail, that visit ends in us rolling around on the ground throwing punches and pulling hair. Maybe it is human nature to nurture a long term weakness simply because of the temporary pleasures it delivers. I am sure if I look closer, I will discover more of those than just the lust for the sweet Nog. Unfortunately, we so often ignore the reality of our situation to reap the benefits, however temporary they may be. I know I do. When it comes to the glory of Eggnog, no matter how problematic it might be, I set aside all knowledge of lactose intolerance, fully immersing myself in the depths of delicious, liquid sweetness.